Old news that Yomiuri Shinbun snuck in on December 31, 2011 says it would have been a forced evacuation in the areas within the 170-kilometer radius from the plant if another hydrogen explosion had taken place at Fukushima I Nuclear Power Plant. It was in the report submitted by the Japan Atomic Energy Commission under the Cabinet Office on March 25, 2011. And what did the PM and his ministers do? They sat on it, lest the information might cause panic. The explosion didn’t happen. Is it OK therefore? No. A tiny group of politicians and government experts gambled the lives of people living in the entire Tohoku and Kanto areas in exchange for appearing as if they were in control and the situation was under control. They weren’t, and it wasn’t’. But at that time, there was a full-on media campaign to discredit any and everyone in any country who dare reported things were not going well in Japan on the Fukushima accident. The Japanese government particularly attacked the foreign press, alleging the foreigners were spreading “baseless rumors” on the accident. It has been revealed that the Japan Atomic Energy Commission under the Cabinet Office compiled a report titled “A rough sketch (outline) of an unforseen accident scenario at Fukushima I Nuclear Power Plant” right after the accident started in March 2011, and submitted the report on March 25, two weeks after the start of the accident, to the then-prime minister Kan. According to the report, if another explosion, such as hydrogen explosion, happened, the worst-case scenario would require: (1) forcibly moving the residents within the 170-kilometer radius areas; (2) evacuation within the 250-kilometer radius. 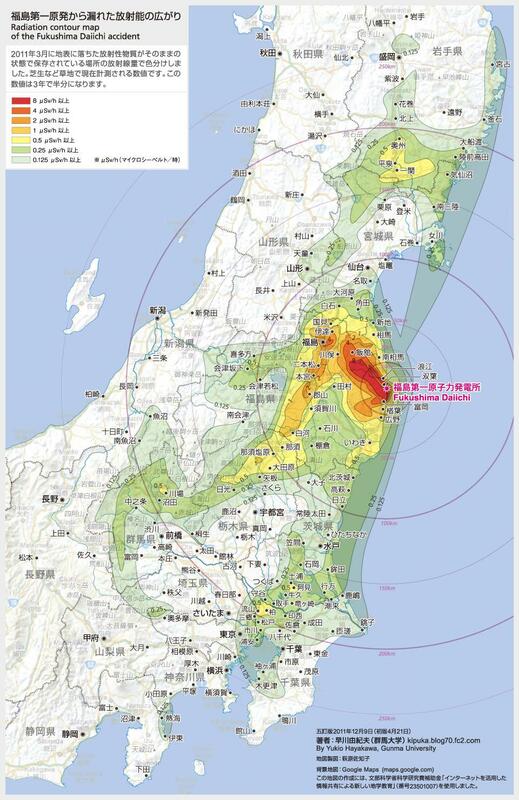 The 170-kilometer radius would include southern Tohoku, part of Niigata Prefecture and part of northern Kanto. The 250-kilometer radius would include most of Tokyo and Saitama Prefecture, and part of Yokohama City. Looking at the Atomic Energy Commission’s website, the report hasn’t been disclosed to the public. Probably never will be. Just like in the full-on global banking and financial crisis that finally hit in 2008 fall, no one with good connection with TPTB has gone to jail over the accident, and probably never will. The Hayakawa map (version 5) below gives you an idea of the areas that would have had to be evacuated. The faint, outer-most ring is 250 kilometer, and the area includes almost all of Tokyo and Saitama, 3/4 of Chiba, tiny part of Nagano, almost all of Niigata, all of Yamagata and Miyagi, half of Iwate and Akita.